CIMON can be seen on the left in the image during a WLAN communications test at the ESA European Astronaut Centre (EAC) in Cologne-Porz on 30 January 2018. People in the background, from left to right: Christian Karrasch, CIMON Project Manager at the DLR Space Administration; Till Eisenberg, CIMON project lead at Airbus Friedrichshafen; and Christoph Kössl, Airbus software systems engineer for CIMON. 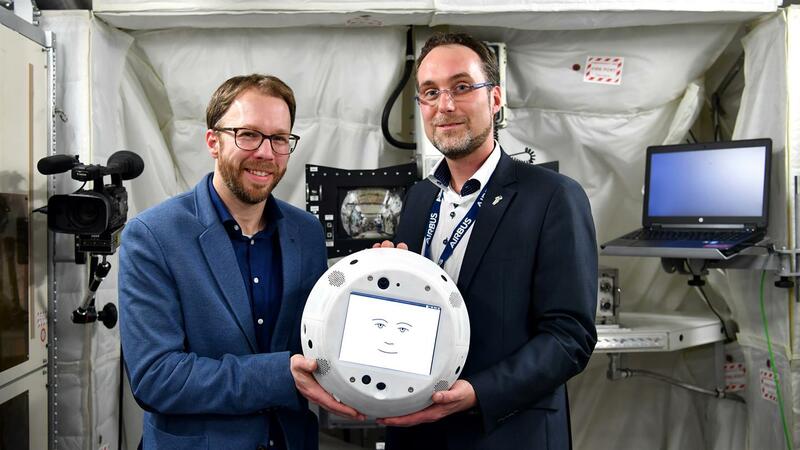 Christian Karrasch, CIMON Project Manager at the DLR Space Administration, and Till Eisenberg, CIMON project lead at Airbus Friedrichshafen, hold CIMON in their hands in the Columbus module mock-up at the ESA European Astronaut Centre (EAC) in Cologne-Porz on 30 January 2018. CIMON is an innovative, globally unique astronaut assistance system. This autonomous flying system is equipped with artificial intelligence and will be used for the first time by German ESA astronaut Alexander Gerst during his ‘horizons’ mission in the summer of 2018. 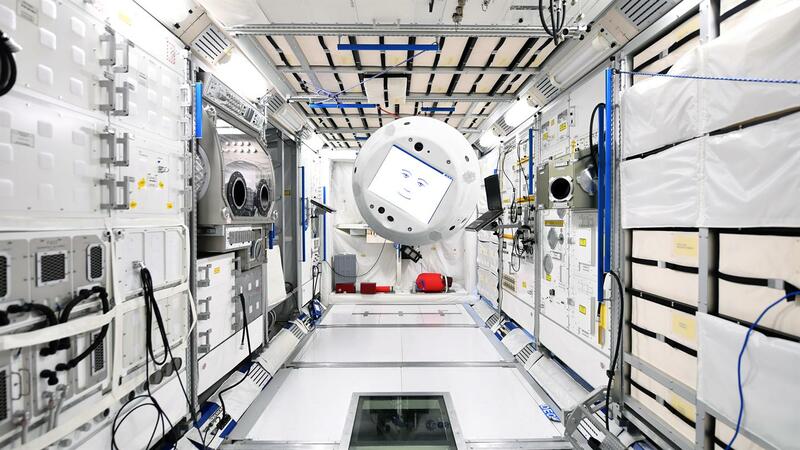 The DLR Space Administration awarded the CIMON project contract to Airbus, and the device was specially developed for use in the European Columbus module on the ISS. The Crew Interactive MObile companioN (CIMON) is able to see, hear, understand, speak – and fly. It is roughly spherical, has a diameter of 32 centimetres and weighs five kilograms. Its robotic predecessor was Professor Simon Wright's 'flying brain', with sensors, cameras and a speech processor in the 1978 cartoon series, 'Captain Future'. Almost 40 years later, CIMON, the astronaut's flight attendant and assistance system, could turn science fiction into 'science fact'. From summer 2018, CIMON will become the new 'crew member' on the International Space Station (ISS), in order to demonstrate cooperation between humans and intelligent machines in the form of a technology experiment. The interactive astronaut assistant was developed and built by Airbus in Friedrichshafen and Bremen on behalf of the German Aerospace Center (Deutsches Zentrum für Luft- und Raumfahrt; DLR) Space Administration and funded by the German Federal Ministry for Economic Affairs and Energy (Bundesministerium für Wirtschaft und Energie; BMWi). Watson AI technology from the IBM Cloud provides voice-controlled artificial intelligence. The human aspects of the assistance system were co-developed and supervised by scientists at Ludwig-Maximilian University Hospital in Munich (Klinikum der Ludwig-Maximilians-Universität München, LMU). An approximately 50-strong DLR, Airbus, IBM and LMU project team has been working on implementing CIMON since August 2016. "CIMON is globally unique in this form," summarises Christian Karrasch, CIMON Project Manager at the DLR Space Administration in Bonn. "We have implemented this experiment in a very short time. It is intended to show to what extent the astronauts' work can be supported in the European Columbus module on the ISS and relieve them, in particular, of routine tasks. Ideally, the astronauts could use their time better and more effectively. With CIMON, we are entering new territory and operating at the threshold of technological feasibility." Following a functional test, the German astronaut will perform three experiments with his artificial colleague. On the agenda are experiments with crystals and a Rubik’s cube, and a medical experiment in which CIMON will be used as a flying camera. When making its space debut, however, the intelligent artificial assistant will not have all the capabilities envisaged by its developers: "In the medium-term, we want to concentrate on group effects that develop in small teams over a long period of time and can occur during long-term missions to the Moon and Mars. Social interaction between humans and machines, and between astronauts and emotionally intelligent flight attendants could play an important role in the success of these missions," explains Till Eisenberg, CIMON project lead at Airbus Friedrichshafen. The engineers are also interested in processing Big Data and data mining. "The aim of the CIMON project is to examine the current capabilities of artificial intelligence in a complex environment such as the International Space Station, in order to provide the best possible support to people in such conditions," says Matthias Biniok, IBM's lead Watson architect in Germany, explaining their interest in the project. For example, CIMON uses Watson AI to process text, speech and images, find specific information and knowledge, and interpret moods and feelings. Biniok adds: "These skills can be individually trained and enhanced within the context of their respective application. Artificial intelligence also makes particular use of artificial neural networks." CIMON also has a scientific background; its advisors are Judith-Irina Buchheim and Alexander Choukèr from the Department of Anaesthesiology at the Ludwig-Maximilian University Hospital in Munich. During a variety of research projects, Buchheim and Choukèr are investigating the effects of stress on the human immune system. "We not only examine patients in intensive care units, but also people exposed to extreme stress and workload as a result of their environment, such as polar explorers in the Antarctic and astronauts on the International Space Station," reports Buchheim, adding: "Our studies show that being subjected to microgravity for a certain period can significantly affect the functioning of an astronaut's immune system. Stress is a major factor here." For example, strenuous tasks that are performed with a colleague are generally less arduous when people work well together. "As a partner and assistant, CIMON could support astronauts with their high workload of experiments and maintenance and repair work, thereby reducing their exposure to stress." According to Buchheim, possible applications on Earth are the support of engineers, researchers and doctors, AI-based enquiries about medical symptoms and everyday assistance for elderly people living alone. CIMON's structure was built entirely using a 3D printing process, and is made of metal and plastic. Its 'face' is a display unit intended to hover at the astronaut's eye level. It can present and explain information and instructions for scientific experiments and repairs. Its 'eyes' are two cameras, and it also has an additional camera for face recognition. Two side cameras are used for video documentation and could also be used for additional computer-generated functions (augmented reality). Ultrasonic sensors measure distances for collision detection. Seven microphones act as 'ears' for detecting where sounds are originating, and there is a directional microphone for good voice recognition. Its 'mouth' is a loudspeaker that can be used to talk or play music. The core speech comprehension element of the AI is the IBM Watson system. CIMON is unable to learn independently; a human must actively train it. The AI for autonomous navigation is provided by Airbus and used for motion planning and object recognition. CIMON can freely move and rotate in all spatial directions using 14 internal fans. 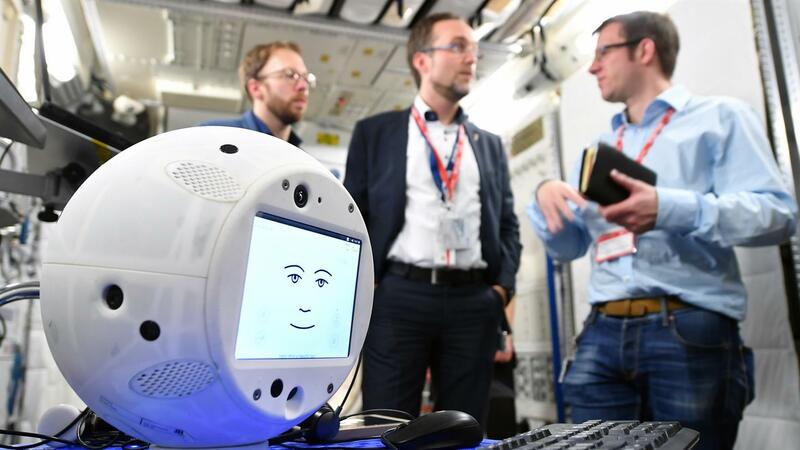 It can therefore turn towards the astronaut when it is spoken to, nod and shake its head and follow the astronaut – autonomously or on command. In microgravity on the ISS, it can be used for two hours. The dimensions of CIMON's face are modelled on the proportions of a human face. Gestures and facial expressions are also possible, as is a female, male or neutral appearance and voice. CIMON's product design was implemented in collaboration with Reichert Design, a company from Stetten am Bodensee. Additional partners are: the European Space Agency (ESA), in particular the European Space Research and Technology Centre (ESTEC) in Noordwijk (Netherlands) for technical integration, BIOTESC in Lucerne (Switzerland) for operational experiment preparation and implementation of the experiment within the ISS infrastructure, the Columbus Control Center at DLR in Oberpfaffenhofen for operational mission planning, and the European Astronaut Centre (EAC) in Cologne.